Fig. 6. (7) Post-embedding immunoelectron micrograph of neurofascin in 14 days old rat sciatic nerve. 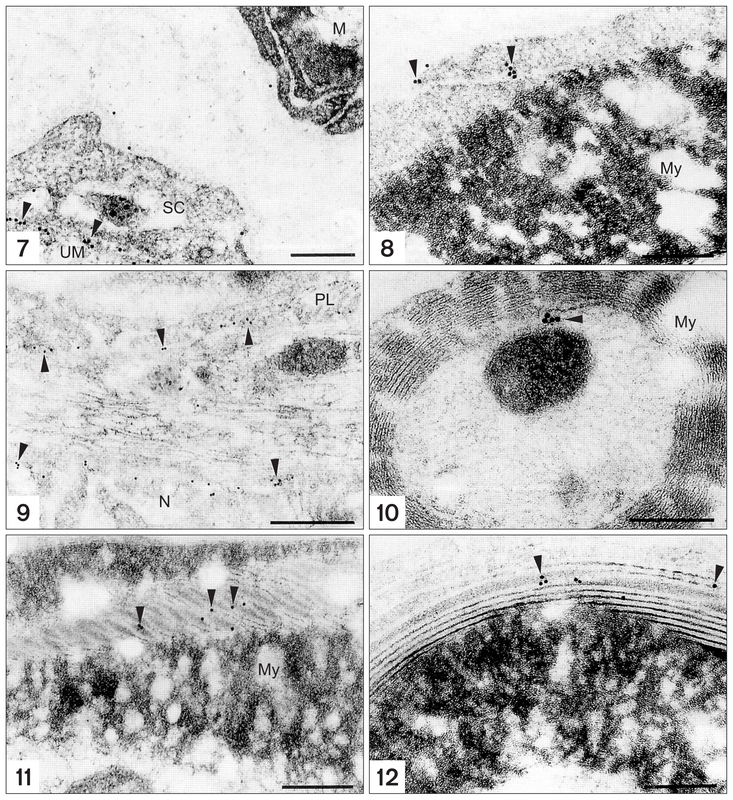 Unmyelinated fiber (UM) expresses neurofascin strongly in the axolemma (arrowheads), but myelinated fiber (M) doesn’t express neurofascin in the axolemma at all. SC, Schwann cell cytoplasm. Scale bar=200 nm. (8) Neurofascin immunoreactive gold particles are labeled in the outer mesaxon (arrowheads). My, compact myelin sheath. Scale bar=200 nm. (9) Node (N) and paranodal loops (PL) are shown. Many neurofascin immunoreactive gold particles are localized in the nodal axolemma (arrows). Neurofascin expression was revealed in the paranodal loops as well. Scale bar=500 nm. (10) Post-embedding immunoelectron micrograph of neurofascin in 5 days old rat sciatic nerve. Neurofascin immunoreactive gold particles are labeled in the inner mesaxon (arrowhead). Scale bar=200 nm. (11) Post-embedding immunoelectron micrograph of neurofascin in 14 days old rat sciatic nerve. Neurofascin immunoreactive gold particles are labeled in the Schmidt-Lantermann incisures (arrowheads). Scale bar=200 nm. (12) Non-compact myelin layer which in composed of apposing Schwann cell membranes expresses neurofascin immunoreactivity (arrowheads), but compact myelin layer doesn’t express neurofascin at all. Scale bar=200 nm. Adapted from the article of (Korean J. Electron Microsc. , 131–140) with original copyright holder’s permission.